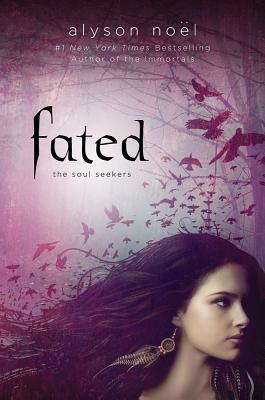 From the #1 New York Times bestselling author of The Immortals, Alyson Noel, comes Fated--a breathtaking new saga brimming with magic, mystery, and an intoxicating love story that will steal your heart away. Meet The Soul Seekers. Strange things are happening to Daire Santos. Crows mock her, glowing people stalk her, time stops without warning, and a beautiful boy with unearthly blue eyes haunts all her dreams. Fearing for her daughter's sanity, Daire's mother sends her to live with the grandmother she's never met. A woman who recognizes the visions for what they truly are--the call to her destiny as a Soul Seeker--one who can navigate the worlds between the living and dead. Alyson Noel is the #1 New York Times bestselling, award-winning author of Faking 19, Art Geeks and Prom Queens, Laguna Cove, Fly Me to the Moon, Kiss & Blog, Saving Zoe, Cruel Summer, and the Immortals series including Evermore, Blue Moon, Shadowland, Dark Flame, and Night Star, as well as the Immortals spin-off series beginning with Radiance. With over 2 million copies in print in the US alone, her books have been published in 35 countries and have won awards including the National Reader's Choice Award, NYLA Book of Winter Award, NYPL Stuff for the Teenage, TeenReads Best Books of 2007, and Reviewer's Choice 2007 Top Ten, and have been chosen for the CBS Early Show's "Give the Gift of Reading" segment, and selected for Seventeen Magazine's "Hot List" and Beach Book Club Pick. She lives in Laguna Beach, California.